The startup drag&bot, with its same-named software, enables the programming of industrial robots without developer knowledge. The spin-off of the Fraunhofer IPA has now completed a seven-digit seed round of financing. One of the biggest obstacles to the acquisition of industrial robots in small and medium-sized enterprises is – in addition to the high investment costs – usually the lack of specialists for the commissioning and programming of robots. The company drag&bot has developed an operating system for industrial robots at the Fraunhofer IPA, one of the world’s leading research institutions in the field of production technology and automation, with which robotic programs can be assembled from different components via drag-and-drop. “With drag&bot, robot programming is as easy as using a smartphone,” explains Martin Naumann, founder and CEO of drag&bot. For the further development of the software, the startup has now received funding in the low seven-digit range. The financing round was led by Speedinvest Industry, a Vienna-based VC specializing in industrial tech, and other strategic partners. 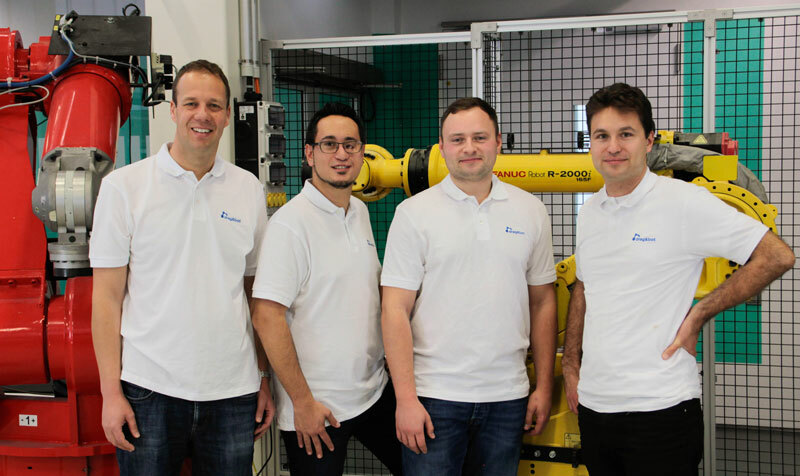 “We see in drag&bot a great opportunity to make robots available for new application areas in industry and thus to make a significant step in the digitization of industrial production,” explains Heinrich Gröller, Partner at Speedinvest. intuitive software industrial robots can be instructed without IT know-how. The functional sequences are first assembled in the cloud solution using the drag-and-drop principle. The parameterization of the individual function blocks is supported by various operating and graphical assistances, so-called wizards. For example, the user guides the robot arm to the required position via hand guidance, the drag&bot Teach Pendant or via the navigation in the system; the movement pattern is then recognized and automatically taken over by the wizard. The most common activities of robots that are can be instructed with drag&bot are the handling of parts, the palletizing of workpieces and the loading or unloading of machines. Even more complex applications such as screwing, clipping cables or the joining of gears are easily possible with the already available modules. For robot applications that require intelligent picture processing, interfaces to popular smartcams and established software products are available. One of the biggest strengths of drag&bot is that even customers and partners can dynamically expand the software themselves and adapt it to their requirements. The programmed functional sequences can be shared with other employees and production sites via the cloud. The software works independently of the respective robot hardware and currently supports, among others, ABB, Kuka, Fanuc, Denso and Universal Robots – other compatibilities are already being worked on. Companies often use expensive external service providers to program industrial robots. That is why industrial robots have so far been used cost-effectively, especially for monotonous tasks involving very high volumes – such as in the automotive industry. It currently orders 40 percent of all industrial robots worldwide and uses them primarily for automation in line production. Small and medium-sized companies must be able to use the industrial robot more flexibly to make the purchase worthwhile. 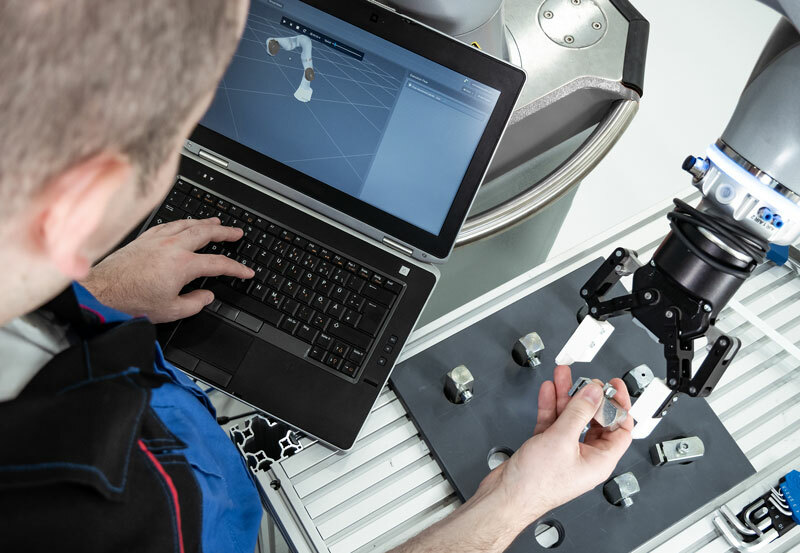 With the easy robot programming software drag&bot, automation solutions can be adapted to the individual needs of manufacturing companies without specific expertise and in much less time. This makes it possible for industrial robots to carry out a different activity in the afternoon, for example, than in the morning.